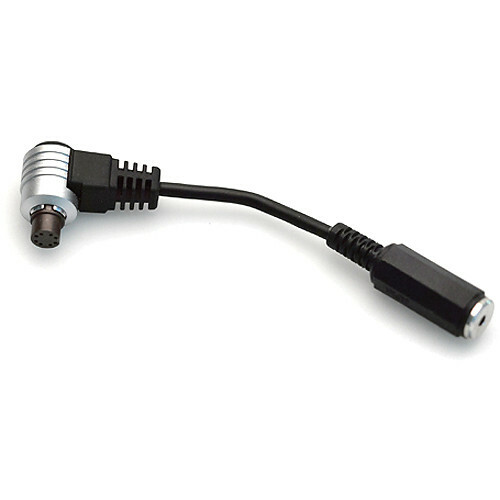 The 4.7"-long Multi-Connector to Mini Jack Female Adapter Cable from Mamiya Leaf allows you to use older large format wake-up cables or Kapture Group 1-shot adapter cables with Credo digital backs via the multiport. It is designed for use with Hasselblad V, Hasselblad H, and Contax 645-mount backs in conjunction with view cameras or other camera systems using large format lenses in mechanical or select electronic shutters. Box Dimensions (LxWxH) 4.6 x 4.5 x 0.5"
Multi-Connector to Mini Jack Female Adapter Cable (4.7") is rated 5.0 out of 5 by 1. Rated 5 out of 5 by Wake-up cable setup from Multi Connector required for Phase/Leaf Credo use I use this to connect PhaseOne/Leaf Digital backs to my Tech cameras. They have never failed me. Very flexible. I am careful with them. Some competitors offerings do kink much easier than these. Kinking breaks the connection. So I recommend these.